If you need a high performing centrifuge for a tight space, this one is “the fittest.” The J-E Centrifuge generates maximum speeds up to 21,000 RPM (53,300 x g) and offers the capacity of processing up-to 4 liters in under 10 minutes. The J-E's high torque switched reluctance (SR) direct drive achieves faster acceleration and deceleration with gentle precision that delivers the fastest separations in the shortest run times, performance unattainable by standard high-speed centrifuges. The comprehensive standard and BioSafe-certified J-series rotors and labware are all compatible with the J-E, for sample sizes from a few microliters up-to 4 liters. For total versatility, select the new AllSpin JS-5.3 high capacity swinging bucket rotor system, which processes up-to twenty-four 96-well microtiter plates and offers the flexibility of processing a variety of sample sizes in bottles from 4 x 500 mL to 96 x 17 mm tubes. 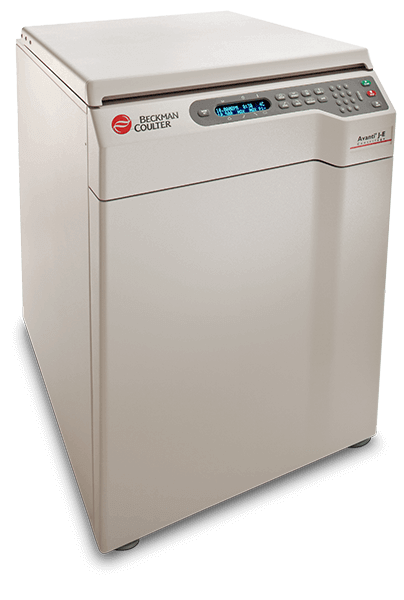 Using CFC-free refrigerants and a maintenance-free vacuum pump to partially remove friction-generating air molecules, the J-E offers better temperature control (-10° C - +40° C in 1° C increments), a more energy efficient system, lower heat output (< 6,900 BTUs) and quieter operation for a comfortable, productive work environment.